Snowy, chilly Sundays have a baffling effect on me. I spend endless minutes starring at the window, thinking about today’s schedule, how I hate my new haircut (and the woman who did this to my hair), how I’m craving dark chocolate right now and when I should start baking cookies and coconut domes for the gift baskets. Thoughts crowded in my head in such confusion and excitement that I end up getting up of bed all dizzy and wobbly. Still in my pajamas and my Pooh the bear slippers, I go to the kitchen to find my dear and sweet hubby already lining up the breakfast on the table, and my daughter holding her bottle of milk and playing with her soccer ball. I eat my granola and wonder how my hubby finds all this energy to talk in the morning. He takes advantage of my still-in-the-moon state of mind to talk politics and ask me some mathematic equations. I am all wobbly again. By the time we get up of the table, it’s already eleven. My daughter takes her nap and I am back to the kitchen to start, or at least try to start my day. I look at the window and it’s snowing. I look at my fruit basket and find my ripe and ready to be eaten plantains pushed to the wall by apples and tangerines. They look so sad. I am so cold. We need each other. And since it’s Sunday and cooking easy meals on Sundays is my motto, fried plantains with a mix of spices were going to be our appetizer. The mix of spices that I used here is called Zahtar (which means in Arabic Thyme). Zahtar is popular in The Middle East (especially Lebanon and Turkey) and in North Africa. It has a woody, warm and slightly bitter taste. It’s basically a mix of lightly toasted white sesame seeds, dried thyme and fennel seeds. Some might add chili flakes for the heat, sumac, dried oregano and cumin. You can also add some olive oil to the spice mixture to form a paste, spread on a pita bread, and toast until crisp. 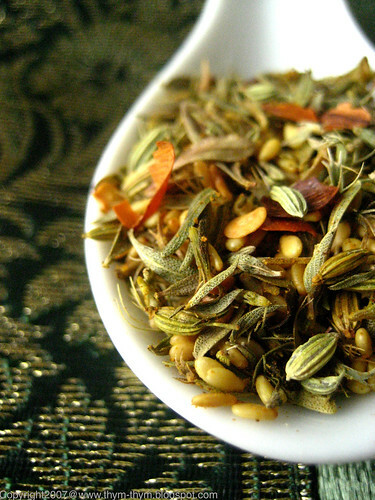 Zahtar is also a magnificent spice mixture for chicken and fish. Just rub and grill. I can only imagine how wonderful it might be as a gift in your Christmas gift basket. My hubby said it was the best plantains he has ever had. Oh! He knows how to melt my heart. The dish was supposed to be served as an appetizer, but we gulped it all down for our snack because it was a snowy and chilly Sunday. In a shallow bowl, mix all the ingredients of the zahtar (excluding the salt) and set aside. Peel the plantains and cut them into fairly thick slices (1/2 inch). Heat the oil for deep-frying in a deep pan to 350F, or until a cube of bread browns in 30-40 seconds. Fry the plantains slices in batches, without crowding the pan and stirring so that they don’t stick together until golden brown. Drain on a double layer of kitchen paper. While still warm, season them lightly with salt and place them in the zahtar bowl. Toss them thoroughly and serve immediately. Dans un bol peu profound, mélanger tous les ingredients (sauf le sel) et mettre de côté. Eplucher les bananes plantains et les couper en tranches relativement épaisses (1 cm). Faites chauffer l’huile de la friture dans une poêle assez profonde, jusqu’à ce qu’elle atteigne 180C, ou jusqu’à ce qu’un crouton, jeté dedans soit doré en 30-40 secondes. Frire les bananas plantains par petites quantités a la fois, tout en mélangeant pour qu’elles ne collent pas les unes aux autres. Jusqu’a devenir bien dorées. Alors que les plantains sont encore chaude, assaisonner légerement de sel et mettre dans le bol de zahtar. Mélanger le tout pour bien répartir les épices. Servir tout de suite. I just discovered this blog through Lobstersquad. It is lovely, and so is the new header! You're great! on m'a offert du zataar d'israel et justement je viens de m'en servir pour un agneau au four . Quel parfum cette association d'aromates .Divin ! Je garde ta recette pour m'en servir de nouveau rapidement .Merci . Ps : très jolie bannière . Awesome, at first I thought you dipped plantains in flour batter... but its don't. I have question what is Sumac and does the slices consume oil while frying?? - Cakespy, welcome to my blog. and thank you very much for your kind words. Glad you enjoy it. - Lili, Mmmmmnnn!! ca doit etre delicieux. On fait un echange de recette alors? - Collywolly, thank you very much my dear. I hope you will like it. My hair looks like a scarecrow hair, but you're right it will grow back and I will send a picture to the other lady ;) Have a nice week. - Shivapriya, sumac is a Mediterranean spice, that is used like we would use freshly squeezed lemon on fried vegetables or fish. It has a sour taste to it, and in this recipe, it is optional. If you're looking to buy Sumac, you can find it at Middle Eastern food stores, or you can simply substitute it in this recipe by squeezing a bit of lemon juice at the end. The plantains don't consume oil while frying, mainly because of the temperature of the oil. 350F for deep-frying is what is recommended, so that the plantains brown quickly but without being soaked in oil. It took less than a minute to have each batch of the plantains browned like you see on the pictures. And if you don't have a thermometer, just let it get nice and hot for about 10 min or so, and do the croutons trick mentioned in the recipe to be sure. I hope it helps. Zahtar and plantains -- I would never have thought to put the two together! Sounds absolutely delicious! No matter how long I live in Michigan, I will always wonder how it can get so cold and windy...I could use an order of these exotic plantains right now. I love zahtar, but my boyfriend does not. It's too bitter for him, which is what I love about it. That means more for me I guess! - Wendy, thank you very much. I love Sundays...and Saturdays. I guess you could say we're weekends persons. - Lydia, thanks a lot. It's a lovely combination as it cuts on the sweetness of the plantains a bit. ANd did I mention how fragrant it is? - Andrea, I hope you will enjoy the combination. Thank you very much. - Ann, is he kidding? ahhh men! my hubby has the same thing, but only with lemons and grapefruits. I love zahtar as a pizza topping. Yum! How beautiful! I can't wait to try these, and this is such an exquisitely written post. Really missed your site while I've been on break. - Hi Amanda, I am really glad to see you too. Hope you had some rest and that you will enjoy Zahar. Thanks for the header and post my dear. You are too sweet. Happy holiday season. wow. this sounds great. 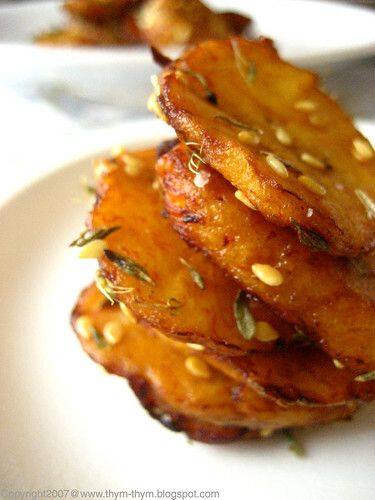 what made you think of plantains with za'atar? 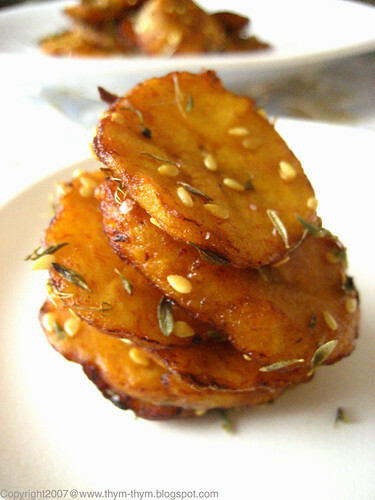 love plantains; i usually make tostones (with salt and lime or red wine vinegar) but i'll have to try this. could be good with slightly sweet platanos maduros too.